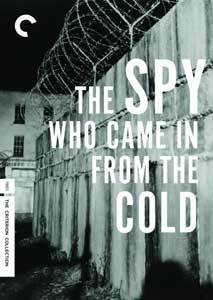 Especially on this side of the Atlantic, we tend to think of the Cold War as wholly binary, and involving only the U.S. and the U.S.S.R.; The Spy Who Came In From the Cold is a reminder that this was more global than a mere superpower pas de deux, as this story involves a face-off between the espionage forces of Great Britain and East Germany. The years since the Berlin Wall has come down has taken much of the sting out of Cold War stories, but it doesn't take too much strain on the imagination or one's memory to conjure up those frightening times, what seemed like a decades-long game of global chicken between East and West, neither side wanting to seem less than manly by removing the metaphorical finger from the button. The effects of that high level of anxiety, for those who were foot soldiers in that war and for those who loved them, was a principal subject of the John Le Carr� novel on which this film was based, and director Martin Ritt has provided a tangible sense of menace. Too much description of the plot will spoil the fun, if you've neither read the novel nor seen the movie; but both are artful in moving Leamas up the food chain, in double- and triple-crosses, in showing us how the Cold War gets fought out on the ground. In fact, much of the movie is little more than men in trenchcoats exchanging information; but the exposition is always clear, and the story always compelling. Much of that is helped along, too, by the leading man. In many respects Burton seems like a Welsh Marlon Brando, an actor of towering talents too often laboring in projects unworthy of him, a sort of genius with apparent disdain for his own craft. But this comes from Burton's most fertile screen period�the following year, he and Liz would rip it up in Who's Afraid of Virginia Woolf?�and the word "craggy" seems to have been invented for him. He can look daggers at you, or glance at you with uncompromised tenderness; his eyes speak volumes, and his presence turns this from merely another spy story into one informed by the theater of the Angry Young Man�put Jimmy Porter from Look Back in Anger into an espionage thriller, and you've got Alec Leamas. Bloom is fine, too, though her part is underwritten; and Oskar Werner as a German d�ppelganger is also very effective. The movie is notable, too, for featuring the one of the first appearances of George Smiley, the spy who figures so prominently in future Le Carr� novels; here he's played by Rupert Davies, but it's Alec Guinness who in coming decades would make the part his own. Image Transfer Review: The picture quality may be the single best reason to upgrade, if you already own Paramount's barren release of the same title. You can almost feel the stalactites of the Cold War in this steely transfer, which renders cinematographer Oswald Morris's images with extraordinary clarity. Audio Transfer Review: There's no gaudy 5.1 remix on this release, which is fine; music is at a minimum, creating the opening for some hiss, but overall this is a very clean track. Extras Review: Criterion's extras distinguish this release as well, and make for a great primer on political filmmaking at the height of the Cold War. In a 2008 interview (39m:03s) with Le Carr�, the novelist reflects on this, his first success, and reminisces about life as a younger man�it's no surprise that he's a great raconteur, and has wonderful anecdotes about director Martin Ritt, and especially screenwriter Paul Dane, who logged some time as a professional assassin. (No doubt that skill set could come in useful at a story meeting.) Le Carr�, on assignment from Ritt, was also Burton's professional drinking buddy. We learn more about the writer in The Secret Centre: John Le Carr� (59m:15s), a thorough 2000 BBC documentary, going over both the writer's life and work. Another career overview comes in an audio interview (49m:00s) from 1985 of Ritt, conducted by Patrick McGilligan�this film is just a small part of that, but Ritt is marvelous company nonetheless. Director of photography Oswald Morris provides a truncated commentary track, for five scenes (39m:23s)�he discusses the movie being shot in Ireland due to Burton's tax problems, and the necessity to make a Checkpoint Charlie more aesthetically pleasing than the genuine article. Accompanying his comments is a gallery of original set designs from the production, which exactly capture the understated tone of menace of the picture. And Burton mouths off in Acting in the 60's, a 1967 interview conducted by Kenneth Tynan�Burton talks about Elizabeth Taylor as the finest actor of his generation; of him being woefully miscast in Virginia Woolf? ; and saves particular invective for Bertolt Brecht: "Loathsome. Vulgar. Petty. Little. Nothing." The first disc also includes an original trailer; and the accompanying booklet features notes on the film by Michael Sragow. The technical TLC and ample extras make this a worthy upgrade from the previous bare-bones release of the title. This remains a taut, well-crafted thriller from a time that can seem like eons ago, though we'll never tire of dangerous men doing possibly dastardly things under cover of night in the name of country.